Is it time to make the investment in your home and replace your worn out roof before you incur internal damage that will cost you a lot more money? All roofs need repair or replacement sooner or later. Regular maintenance such as cleaning eaves, gutters and downspouts can help prolong the life of your roof. Periodic roof inspections will help you spot developing problems before they cause costly damage to your home. The extent of the problem and age of the roof are key factors that can help you decide whether to do repairs or replace the roof. Roman tiles - flat in the middle, with a concave curve at one end at a convex curve at the other, to allow interlocking. Pantiles - with an S-shaped profile, allowing adjacent tiles to interlock. These result in a ridged pattern resembling a ploughed field. An example of this is the "double Roman" tile, dating from the late 19th century in England and USA. Roofing shingles are made from several types of materials. Wood shingles are sawed from red cedar or pine. Modern shingles are cut from new growth trees and must be treated with chemical preservatives to make them last as well as earlier versions that were cut from old growth trees. They must also be chemically treated to achieve a fire resistance rating comparable to other types of shingles; in fact, the highest rating can be attained only by installing them over a special subsurface layer. Aluminum shingles have a long life span, although they are comparatively expensive. Asphalt shingles cover about 80% of the homes in the United States. Their popularity is due to their relatively light weight, comparatively low cost, ease of installation, and low maintenance requirements. A typical asphalt shingle is a rectangle about 12-18 in (30-46 cm) wide and 36-40 in (91-102 cm) long. Popular styles have several cutouts along one edge to form tabs that simulate smaller, individual shingles. Three tabs are common, but the number may range from two to five. 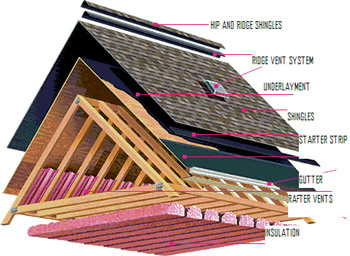 Some styles are made to interlock with adjacent shingles during installation, creating a more wind-resistant surface. Flat roofs tend to be sensitive to human traffic. Anything which produces a crack or puncture in the surface can quite readily lead to leaks. In other words, this sort of roof has a major weakness to failure from subsequent work done on the roof - such as upgrading building HVAC systems and so forth. It is thus not generally advisable to use a flat roof as a living area unless steps are taken to protect the roofing membrane from those using the area, for example, by building a wooden deck over the surface or using paving stones or similar materials to protect the roof membrane. It is not advisable in general to have living areas directly under such a roof either, due to the high likelihood of eventual leakage.